Sony Europe's Image Sensing Solutions has launched its first industrial vision module to use the USB3.0 standard. The GS CMOS module, which is available in both colour and black and white variants, has a 1.6 MP resolution (1456 x 1088 pixels) and transmits data at over 100 frames per second. The XCU-CG160 has been designed to give a simple migration path from CCD to GS CMOS, allowing the switch without system upgrades or a changed architecture. 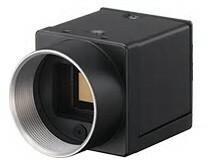 At its heart is the 1/3-type Sony Pregius IMX273 sensor, a replacement for the well established ICX445 CCD sensor and gives significant improvements in sensitivity, dynamic range, noise reduction and frame rate capability. The modules have been designed to lead the market in terms of image quality, and are targeted at a wide array of industrial vision and non-manufacturing markets - from print, robotics and inspection to medical, logistics and general imaging. Key image-processing features included on the device include area gain and defect pixel correction. Shading correction has also been implemented. The module has a minimum illumination of just 0.5 lx, the colour module requires just 12 lx and comes with a manual, auto and one-push white balance setting. Both modules have a sensitivity of F5.6, a gain of 0 to +18 dB, a shutter speed of 60 s to 1/10,000 s.
"For those who have overall responsibility for machine vision systems, the migration path from analogue to digital is front of mind. The XCU-CG160 makes this an easy process with the added advantage of superb performance," said Matt Swinney at Sony. The C-mount module measures 29 x 29 x 42 mm, weighs 52g, and has an operating temperature of -5oC to +45oC. It meets UL60950-1, FCC Class A, CSA C22.2-No.60950-1, IC Class A Digital Device, CE : EN61326 (Class A), AS EMC: EN61326-1, VCCI Class A and KCC regulations.